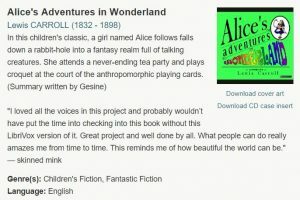 LibriVox – Over a thousand online audio children’s books. These are classics that are past their copyrights and come from the Project Gutenberg. Recordings are Public Domain in the USA. Read by volunteers. Some titles include: Adventures of Huckleberry Finn, The Adventures of Pinocchio, Alice’s Adventures in Wonderland, Rumpelstiltskin, Robinson Crusoe, Black Beauty, The Wonderful Wizard of Oz, and more.